Trump: Syria, Iran, Russia Attack On Terrorists In Idlib Will Be Mistake 1.7272727272727 out of 5 based on 11 ratings. 11 user reviews. On September 4th, US President Donald Trump warned Russia, Iran and Syria against a “reckless attack” on the Idlib Province in Northwestern Syria. Syrian President Bashar al-Assad and allies have been amassing a huge military presence near Idlib in recent days, where opposition fighters and terrorist groups are holding out among a population of approximately 3 million people. The UN also warned that it was bracing for “the most horrific tragedy” in Idlib and dubbed it a “dumping ground” for militants and civilians who have been pushed out of successive pockets of opposition-held territory. Staffan de Mistura, the UN envoy for Syria, warned as many as 800,000 people could be displaced if the fighting does begin. Trump’s tweet comes as Iran’s foreign minister Mohammad Javad Zarif at the start of his visit to Damascus said that “terrorists must be purged” from the province and Idlib in its entirety must be returned under government control. “Syria’s territorial integrity should be safeguarded and all tribes and groups, as one society, should start the reconstruction process, and the refugees should return to their homes,” Mr Zarif said. Zarif met with President Assad and the Syrian Foreign Minister Walid al-Moallem. They mostly discussed the expected September 7th summit, which will happen in Tehran. Russian, Turkish, Syrian and Iranian leaders are supposed to meet and discuss the situation in Idlib. Zarif also said that a consultation “with our Syrian friends” was necessary prior to the summit. Assad and Zarif also discussed what they called “western pressure” on their two countries, in apparent reference to the US sanctions on Iran and calls for limiting Iran’s role in Syria. Israel has grown nervous of Iran’s growing presence in Syria and threatened to prevent a build-up of pro-Iranian forces near its frontiers with Syria. Russia, another Syria ally, and Damascus have also said that Western countries are preparing to carry out strikes against Syria ahead of the Idlib offensive. On August 26th, Iranian Defense Minister Amir Hatami visited Damascus, where he signed a “defense and technical agreement.” This showed that Iran does not plan to reduce its influence in Syria, much to Israel’s discontent. Russia also acknowledges that the pressure from the US and Israel to persuade Iran to withdraw its presence from Syria cannot lead to any actual results. PressTV also reported that US calls for Iran and Hezbollah to leave Syria are meaningless. The outlet cited Lebanon’s al-Akhbar daily which reported that a US delegation, comprising security and intelligence officials had visited Damascus and June and met President Assad’s special security advisor Ali Mamlouk. According to the report, the meeting set three conditions for US forces to leave Syria, including the withdrawal of Iranian advisors from southern Syria near the Israeli-occupied Golan Heights, data on “terrorist groups” and a role in the oil business in eastern Syria. The US State Department denied these claims. Furthermore, Russia also said that the reports are untrue. Hezbollah and the Syrian government are now in the stage of “successive victories for Syria and its axis. We have lifted this black cloud, victories will continue, and we will achieve more,” the Hezbollah official noted, cited by PressTV. Yes Lupus, it seems that the ‘ beautiful babies’ do not matter in Raqqa Syria, Mosul and all of Iraq who the US bombed to death. 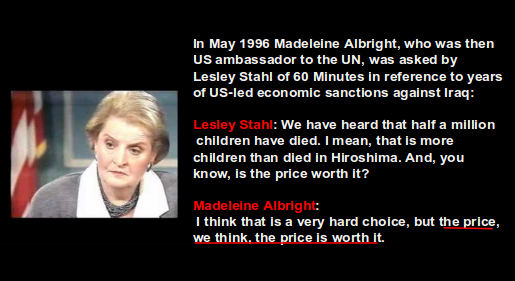 There is also Falluja where the US used radioactive munitions and lets not forget the words from the old crone , Madeline Albright ( a Jew who wears a Christian cross) who said that the circa half a million children who died in Iraq due entirely to US medical and food sanctions ” Were worth it “. The FUKUS gang deserve a bloody defeat. They will be at their most dangerous then of course but we are nearing the time when the rabid dog named FUKUS must be euthanized to ensure the wellbeing of everyone else. Once FUKUS falls , so will their satellite dictatorial nation states in Africa etc. 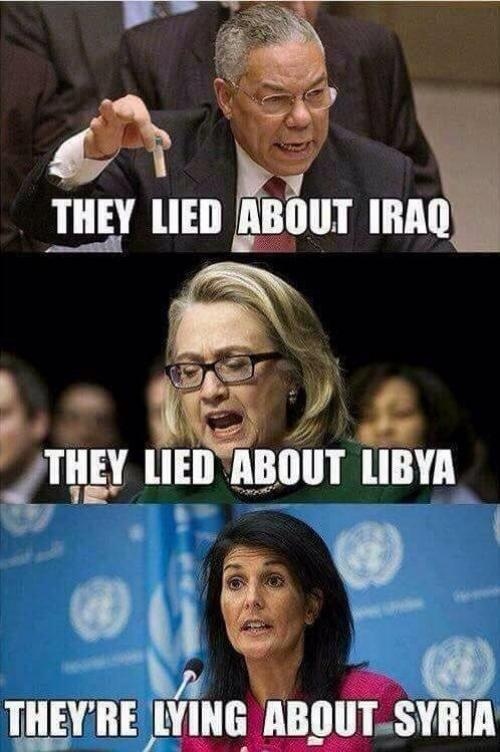 And they will continue lying forever and ever because as their teacher (Israel), they are professional liars. Yet they continue to get away with all their lies AM. I do feel though that the Russian/Chinese buffers are ahead and that Libtard train filled with liars is about to crash into reality. With you there, which is why the liars are freaking out. They understand they are on borrowed time, with nowhere to go. Perhaps the UK will offer asylum to the Head Choppers on humanitarian grounds AM. Head Choppers and the UK, reminds me of Cameron, standing next to President Putin. Did not realise at the time, we were financing Cameron’s ‘head chopping mate’s. Bet they ignored the boar’s and gifting one of the animal’s heads to Cameron. LOL. Just loved Cameron’s face. Considering that the US literally leveled Raqqa and Mosul off the face of the earth this is irony so thick you can serve it up in an ice cream cone. Again a case of the West accusing others of doing what it itself is doing 10x worse. USA people are proud of their children who go to kill someone else in the world. 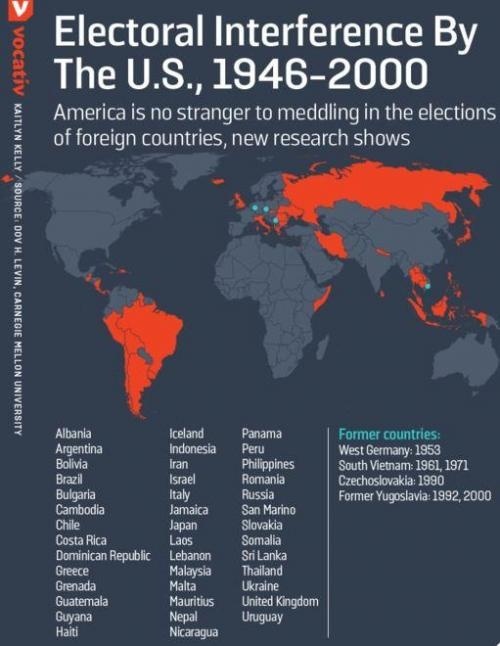 USA makes them believe that they are doing something VERY IMPORTANT FOR THEIR COUNTRY, and USA is right ! they are keeping the american way of life (kill without question it). It would be interesting to hear what the silent majority in the US feel about this. If the situation takes a turn for the worse, Trump will not see past 2020. BBC Headlines, today, saying Russia have started the airstrikes on Idlib. Yes i heard same on cbc, which quoted that fat guy from coventry UK. I wouldnt beleive it right away. Regardless, us and friends can cry all they want. Its over for idlib. Hope it is true, owing to clearing out the savages. Closing down the CW ‘false flag’, before it starts. Warplanes of the Syrian Arab Air Force and the Russian Aerospace Forces have started carrying out airstrikes on positions of militants in southern and western Idlib, according to pro-government sources. From South Front. Now look how the West will spin it, now they have been denied their ‘CW False Flag’. No doubt they will use the photos of Raqqa, which the US took out, and claim it is a Russian Strike. Russia will show the video audit trail, which the UN will ignore. At the same time, pro-militant sources and journalists of mainstream media outlets have spread a series of reports claiming that “Russian airstrikes” have already hit a number of civilian objects – for example in the villages of Jish al-Shoughour and Mhambel widely known as the strongholds of Hayat Tahrir al-Sham (formerly Jabhat al-Nusra, the Syrina branch of al-Qaeda) and the Turkistan Islamic Party (TIP). In response, Hayat Tahrir al-Sham and the TIP have shelled Syrian Army positions in northern Hama. The situation is developing. That means butcherAssad and hitlerPutin now again are bombing moderate civilians who refuse to vote for dictatorship and only want freedom. McCain must be proud, ‘Trump has turned’. Didn’t he campaign on the peace ticket? Wanting the US out of Syria, not supporting their ISIS/White Helmet terrorist mates. Trump, May and Benjanyahu should have to move their asses out of Middle East countries as soon as possible. Delusion, misuse of force and tricks could not work for them anymore. Their whole history is dirty. What a dumb statement for a sitting US. President to make? As far as protecting anything their list is short. 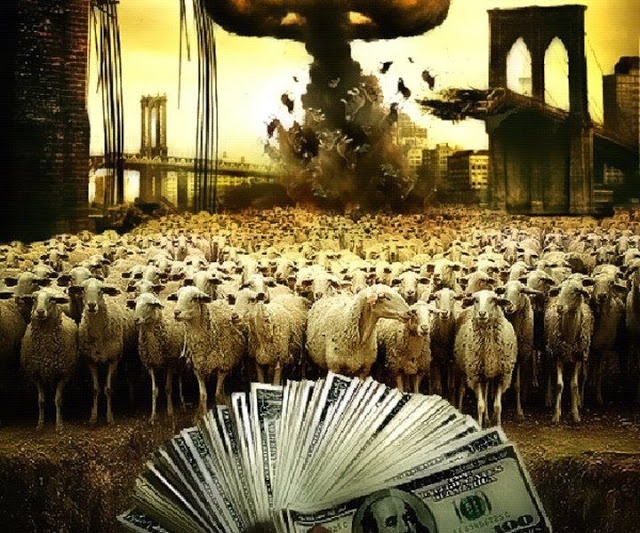 The Petro-Dollar, Rothschild Zionists and useful idiots. Those who gave the world My Lai now lecture those who rescued Aleppo? The smell of US exceptionalism pervades Raqqa, the smell of rotting civilians. Did those who planned regime change across the ME even once consider saving any civilians? Prove it! Name the success! Now Russian did a regime (removal) in Crimea. Show us the unburied bodies, the shattered utility infrastructure, the broad representation of terrorists from across the globe torturing the remaining “saved” civilians, stealing the humanitarian supplies as in Libya. Where is their gold? Then let us visit Palestine and witness the Zionist at work. It’s black and white folks. The Gaza strip or Crimea? The symbol of one, Walls and barbed wire, the other, a beautiful, new, vehicle and railroad bridge. Snipers shooting kids or a peaceful flourishing society? This is the choice we have. It’s stark, simple, vivid really. Oh you say, I am safe. Maybe for a while. Look at how they value human life. You trust them to spare you? 2nd paragraph needs some work. Edited a bit. But thanks your stuff rocks. Crimea should be taught as Lessons in Regime Change at Chatham House & at all of the other Foreign Policy “think-tanks” where we get to hear what is being contemplated within the Intelligence & Foreign Policy communities of FUKUS ……… somehow, I don’t think it will ever fly with them ‘cos their precondition for all interventions on foreign fields is enormous spending on the Military Arm which, of itself, involves deployment of military assets, lighting the fuse and then stepping back as regime-change occurs.. Meanwhile, the leaders of the cabal load up with $$$$$ generated by the latest foreign intervention …….. win or lose: it does not matter ‘cos all that really matters is how much money they can make on the backs of taxpayers. It’s just a perfect illustration of the f.uk.us and fiends mission contrasted against the Russian ones. Ukraine is in free fall and Crimea seems fine. You can throw all the propaganda in the world at it, but the facts on the ground remain. It’s like calling the cops in the US. They show up, kill your husband and dog, while the crooks, waltz away with all your stuff. After a while we figure out we need to organize a neighborhood watch program, to protect us from the cops. That is exactly what the world is doing now. Organizing protection. Iraq and Iran allies now, they had a huge war not that long ago, but they have since figured out who the real enemies of humanity are. One person at a time, at some point the knowledge will expand exponentially and the enormity of the lies will not be explainable. I also warn Syria to abstain from violence in Idlib, and I urge Russia and Iran NOT to participate in any military actions that could jeopardize children, women and elderly unnecessary in Idlib. I express my concerns about the whole idea of military intervention and urge butcherAssad, hitlerPutin and terroristRouhani to enter into a dialogue with their moderate counterparts in Idlib and talk it over so democracy, human lives and freedom can flowerish in Syria. Hereafter its up to Putin and Assad what they will do, and the responsibility for all killings and destruction in Idlib is now on their shoulders, not mine. Because I have here expressed my concerns and been warning you duly about it! No Donald . The real mistake was to put US soldiers at risk in aid of terrorists. A betrayal of their service. Surrendering vital U.S. interests to Israeli lunacy is next. My Goodness! Now other countries need American permission even to make mistakes. Why can’t they be allowed to make their own mistakes, instead of being forced to make American mistakes? Does America claim a monopoly on mistakes, no one else can have an unauthorised mistake? MAGA! Mistaken American Greed Again!! Remember what Washington did to defenseless Hiroshima and Nagasaki? The US is no position to tell Syria what it can do inside its own territory.